In this retelling of a classic fairytale, the big bad wolf is back, all dressed up in Grandma's nightie-but it's not having quite the effect he was hoping for. One glorious day the wolf meets Red Riding Hood strolling through the woods. She looks a clever girl, but the wolf knows... read full description below. The big bad wolf is hungry and on today's menu is Grandma, with Red Riding Hood for dessert. But no one is home at Grandma's house, only a nightdress lying on the bed. 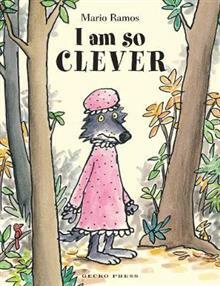 The wolf puts on the nightie and sets off to see what he can catch dressed as Grandma. Here comes Red Riding Hood. She looks clever, but the wolf knows who is smartest . . . Yet this little girl is not so easily duped. And the wolf finds unexpected hazards in wearing a frilly petticoat in the deep dark woods. I Am So Clever is an international bestseller from the author of I Am So Strong and I Am So Handsome. Mario Ramos (1958-2012) is a Belgian author and illustrator, whose work has been published all over the world and received many awards including the Prix Versele and the Prix des Critiques en Belgique. His books I Am So Strong and I Am So Handsome are also published in English by Gecko Press.